The private Villa Florida is the place which harmoniously combines the historical beauty and the modern times. It was built exactly one hundred years ago by E. Schody – the architect from Vienna. The Villa was completely restored in 2007, but outside it retained most of its centennial shine, colored with nostalgia, and inside it is equipped with everything we expect from the modern surroundings. 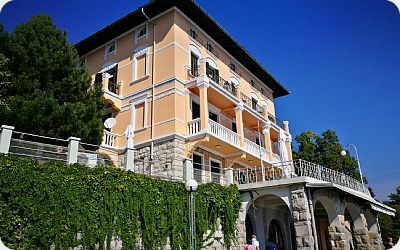 The Villa is situated exactly on the coast, in Ičići, the pearl of the Opatija Riviera. In front of the Villa passes the famous 12 km promenade „lungo mare“. Nearby is Učka, ACI marina, tennis courts, lungo mare promenade, Opatija and Rijeka – the important cultural and business centre of the region. Approximately an hour away from the Villa one can enjoy the skiing on the Platak and the natural beauties of Gorski kotar. All that guarantees the pleasant stay in the Villa throughout the whole year. The climate, the location, the tradition and the quiet surroundings give the special atmosphere to the Villa during the whole year. The summers are warm and shady, the winters are mild and without the snow and the spring and the autumn are magical and healthy. The Villa is the private property where during the year its owners live as well. It is especially interesting for the business people from Europe and wider, who are in any way connected to this region. We recommend you to stay in the Villa for the longer period. Two luxurious apartments in the Villa Florida are for rent throughout the year. On the first floor of the villa there is a comfortable apartment of 140 m2 with 4 big rooms with spacious loggias. The apartment is furnished in the combination of antique and modern furniture. It has first-class equipped bathroom and kitchen, air-condition, central heating, satelite TV, internet and the phone. It has spacious, unique terrace, garden (park) with the barbecue, its own beach and the parking place in the backyard. It is situated on the very edge of the promenade which passes below the villa. It has 70 m2, it is comfortable, air-conditioned, equipped for the summer and enjoying in the sea and sun on your own terrace and the villa's beach. The apartment is safe and comfortable for the parents with the small children.